Please contact us to set up a custom trip for you! $400 per person/per night/double occupancy, $450 pp/pn/single. Trip length: 2 to 7 days. Moderate to challenging. Group size - 1 to 9. The self guided Vermont inn to inn tour takes you on the trails and forest roads of the Moosalamoo National Recreation Area within the Green Mountain National Forest and vicinity of western Vermont, and on quiet country lanes and byways in the Champlain and White River Valleys. You cover 8-12 miles a day through forest, ridge and valley terrain. the hiking is easy to moderate with challenging options. Stays are at small country inns and B&Bs, most of which are located in quiet villages and scenic spots. You'll be on your own carrying only a small pack, while your luggage is transported to the next inn, never having to drive! Just to name a few of the highlights you'll visit are secluded Silver Lake, Rattlesnake Cliffs with it's spectacular Champlain Valley view, Robert Frost's summer cabin, waterfalls, part of Vermont's famous Long Trail, the cozy Ripton and Warren Village Stores, and historic Middlebury and Brandon. There are many hiking options available to choose from depending on your ability and conditions of the terrain at the time. 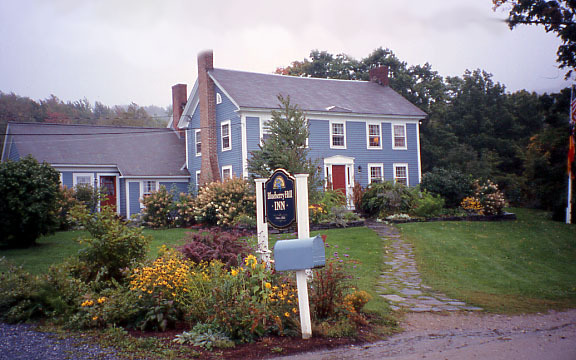 Each night's stay is at great little inns and B&Bs, such as the Chipman Inn in Ripton, Blueberry Hill Inn in Goshen, Inn on the Green in Middlebury, Inn on Park Street or Brandon Inn in Brandon, Huntington House in Rochester, or another one of the fine area inns. Dinner is usually at the inn or a local restaurant nearby. The order of the itinerary will depend on availability of the inns at the time you want to come, so no two trips are entirely alike.